I don’t even have to explain that thought, do I? You’ve already run with it in your head. Weird politics. Weird weather. 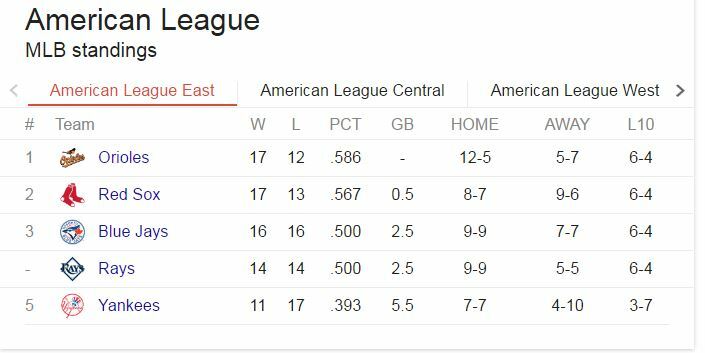 Weird AL East standings. But then, Mets’ starting pitcher Bartolo Colon, known on this blog as My Metropolitan Dumpling, does something beyond weird. He does something extraordinary. He does something that no other ballplayer has ever done. Last night, at age 42, he became the oldest major leaguer to hit his very first home run. It was real and it was spectacular. But, here. Let’s watch it again in Spanish. That home run trot took some 30 seconds. He earned every slow, savoring step of it. Bartolo Colon, my Metropolitan dumpling, hit a home run last night. It just sounds right, doesn’t it? Maybe this world is going to be ok after all. Or, maybe not. But, at least we can watch this over and over again until it is. This entry was posted in Baseball and tagged Bartolo Colon, NY Mets by Jackie, The Baseball Bloggess. Bookmark the permalink. Maybe we have him to thank for today’s sunshine, as well! All the rain finally got me to put up a rain delay book club post. Hope you’ll join in! I also love the ‘nickname’ you gave him – but when your light shines – it sure shines bright! and thanks for letting us know of his grand achievement! It was special! I hope he got the ball, bat and anything else he had on stored in a special place! The HOF will want it, right?! The Orioles had six home runs yesterday (including a grand slam) which was pretty exciting, but my Dumpling’s clout was quite a beaut wasn’t it? Love that you post Spanish language call of his home run here, Madame Bloggess, and seeing the way his teammates punked him by disappearing into the tunnel before he got back to the dugout. Ain’t baseball grand? Oh, I agree completely, Ms. Umpire — baseball is grand! To watch how delighted his team was for him was almost as wonderful as watching the homer! Metropolitan Dumpling has a certain ring to it, but then so does Bartbino. I’m torn. SOOOOO funny – the minute I saw that I immediately thought of you and your Metropolitan Dumpling!!!! He DID IT!!!! It was so funny because as soon as I saw it I thought – It’s BB’s dumpling!!!! After living out of the country for the last 16 years and not having a TV, I don’t think I’ve even ever heard of your dumpling. But that’s a very cool moment for baseball, thanks for sharing it. And yay! Orioles in first place! Always like when that happens, even from here.